Hotel Middle Path, Hotel in Pokhara Nepal, is a Budget but very service-oriented hotel which is clean, comfortable, elegant, safe and secure and centrally located in the lakeside of Pokhara. You can enjoy the convenience of the shopping center meanwhile having the quietness of stay. They have got training and long working experience in Japanese hospitality, theyare always helpful to the guest and take care of the employees, which will make you feel at home. 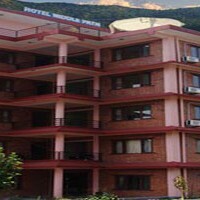 Hotel Middle Path is primarily located in the heart of Pokhara , just nearby the Phewa lake. You can have a nice view of the lake and the snow mountain peaks through the room windows. The location of the hotel is also convenient for transportation, just a 15 minutes taxi ride from Pokhara Airport, or a 10 minutes ride from the tourist bus station. All rooms with ensuite bathroom, TV, Telephone, free Wi-Fi Internet, A/C etc. Beautiful and peaceful garden, Roof top Terrace with breathtaking mountain views for tea break.